Here is a baby favorite - and packed with beta-carotene! There has been some concern about nitrate levels in carrots, and it was found that a large amount of nitrates can act as a kind of poison for very young babies. Please see our section on nitrates in the Foods to Avoid section of our website. But, there is no reason to believe that nitrates are a problem for your baby past 6 months old. Also, if you use organic carrots then the organic fertilizer has natural nitrates unlike chemical fertilizer which can create a higher concentration of nitrates. One way to avoid the whole problem is that jarred baby food is tested for nitrate levels so it should be safe. Keep in mind, there is a big difference in taste from organic to non-organic carrots. Organic carrots tend to have a much stronger carrot flavor, while non-organic carrots can seem more watery. If you can find medium sized carrots with the leafy tops still on - these can be the freshest and tastiest. You can also buy the "baby" carrots which are bagged and already peeled. Baby carrots have been precut for easier snacking. Steaming or microwaving carrots are the easiest methods to cook them. First peel the carrots because the peel has a bitter taste that baby probably won't like, unless you have purchased the baby carrots. Then cut the carrots into 1/2 inch slices. Simmering - cover with water, and cook on high until soft enough for baby (about 5 minutes). Microwaving - put them in a shallow bowl with 2 tablespoons water. Cover with a lid or plastic wrap. Microwave on high for 3 minutes, shake the container, and microwave at 1 minute intervals until carrots are tender. Puree carrots in the water you cooked then in and/or add a little more liquid to get to desired consistency. Store in plastic bag in the refrigerator for 2 weeks. Are there baby food jars? Yes. 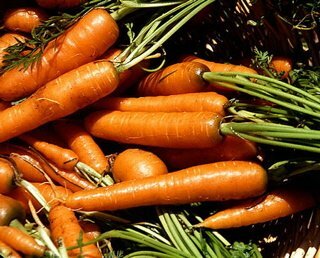 Carrots have a thin skin, so they are susceptible to pesticide contamination and they taste so much better if they are organically farmed. Grate carrots and add raisins. Add yogurt until coated and season with salt and pepper. Taste to correct seasonings.. 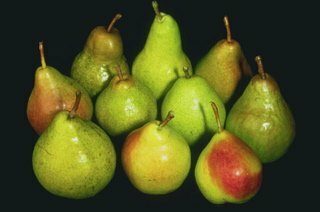 There are many common varieties of pears - Bosc, Bartlett and Anjou are common ones and all are delicious. Because your baby is so new at eating, we will start with the easy to find and easy to mash, Anjou pear. This pear is green all over and the most common in the United States and you should be able to find it year round. Determining the ripeness of pears is unlike peaches and other fruit that turns soft to be ready to eat. Usually, you squeeze the outside of the fruit to determine its ripeness. Pears ripen from the INSIDE OUT so you want to press your finger at the base of the stem and feel how it soft it is. If this area is soft the pear is ready to eat. Pears ripen from the inside out so you want to press your finger at the base of the stem and feel how it gives. If it is soft the pear is ready to eat. Be sure to buy a few hard ones and a few soft to have pears all week. Look for pears that don't have blemishes and that yield to soft pressure if you want to buy a ripe one. Try different varieties of pears that exist in your supermarket. For now, stay away from Bosc pears because they will be too hard for your baby to eat. For baby you will have to peel the pear and then mash it up. Wait until the pear is really ripe so it will be easiest to mash it. Store on kitchen counter. Pears will ripen here well. Refrigeration will slow the ripening process, so store in the refrigerator until ready to eat. Here is a suggestion for a special salad including pears. There is no reason you need extra fancy ingredients to add your baby's leftover pear to a salad. It's yummy! Chop pear and mix with lettuce mix. Toss with olive oil to coat and add vinegar to taste. Crumble goat cheese and add walnuts to top of salad and serve. If your baby is not taking to solids don't despair! Try mixing formula or breast milk in the new food to help the new experience along. Gradually reduce the amount as your baby gets more used to the consistency of solid foods. Remember your baby is getting all of its nutrients from breast milk or formula. 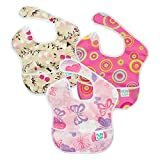 This introduction to solids is just extra calories - he/she does not NEED to eat solids to grow so don't worry if your baby won't even open his or her mouth. She will get there eventually. Our free 26 week course includes 52 age appropriate foods to try with your baby.